Characteristics of the Egyptian Zodiac Sign Mut: If your sign is Mut, you keep who you are locked away, revealing it only to those closest to you. You can be extremely shy, especially when it comes to your love life. Yet, to the person lucky enough to win your heart, you reveal great wisdom, generosity, and someone who doesn't play games in a relationship. Your shyness can lead you to seek a partner who is protective, similar to a father figure. While you do have bouts of sadness, you have great dreams for your life and are determined to make them come true. 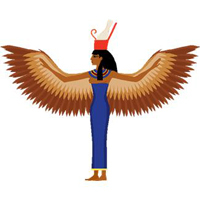 About the Goddess Mut: Mut is one of the oldest Egyptian deities. Her name means mother, and she essentially is the mother of the world. She is a creator goddess associated with the water from which all life stems. Mut, herself, didn't have parents, but was created from nothing. Mut evolved over the years as different parts of Egypt became more powerful than others. Sometimes she assimilated other goddesses, such as Sekhmet and Menhit. All the changes diluted Mut until eventually, she became assimilated into Isis. Because of all the changes to Mut over the centuries, she is represented by a variety of animals – a cobra, cow, white vulture, and a lioness.